Chess’s production history is complicated, and frankly, rather sketchy. It reads more like a supermarket tabloid than an account of a major theatrical endeavor, with politics, illness, and romantic affairs coloring its difficult journey to the stage. There have been productions of Chess in many major cities with new rewrites for each new production, providing me with lots of reading material in the months leading up to rehearsal. Each production has a wildly different take on the characters’ relationships, ultimately finishing with a different ending every time. Per his suggestion, I went back to the original concept album, and worked from there, but I was still at a bit of a loss. How do you tell a story that has so many elements, especially when the story itself changes every time it’s performed? But then I got to thinking, and tried to think back to my first encounter with this show, and realized, that’s where the real story was—the very first emotional tie people have with this show. I’ve loved Chess since my mother first introduced me to it as a child. From the start, I noticed two things: the elements used to tell the story, and how the union of those elements was really the memorable part of the narrative. And suddenly, the more I listened to it, the more I discovered about storytelling as a whole, learning how to combine different artistic mediums—song, dance, lights, art, plot—to create the story. 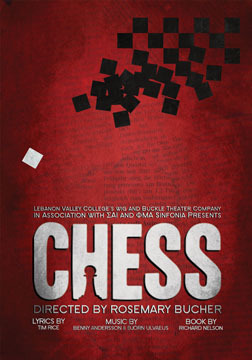 So when I thought to what I first loved about Chess, I realized where productions of this show have gone wrong. They compromised one element of the show for another at different points in the plot. First and foremost, Chess is a story, and that’s something that was lost somewhere along the way. Since its inception, it has always been intended to be an unusual and abstract theatrical experience, but focusing on just the music or just the story takes away from the spectacle of it all and ends up compromising the overall experience. We could tell the story best by balancing out these elements, making them all equally important. And once I had that epiphany, I knew where to go. “First thoughts are often the best,” indeed. Tonight, you’ll see a production featuring nearly 60 of LVC’s most talented students, from its artists, singers, actors, musicians, technicians, staff, and dancers, all collaborating to tell this beautiful story. Wig and Buckle’s production is based on the original London production, as the storyline is simpler, clearer, and doesn’t include oddities such as dancing astronauts, rapping secret agents, machine gun-toting referees, or random German drinking songs that were added in later revisions of the script. 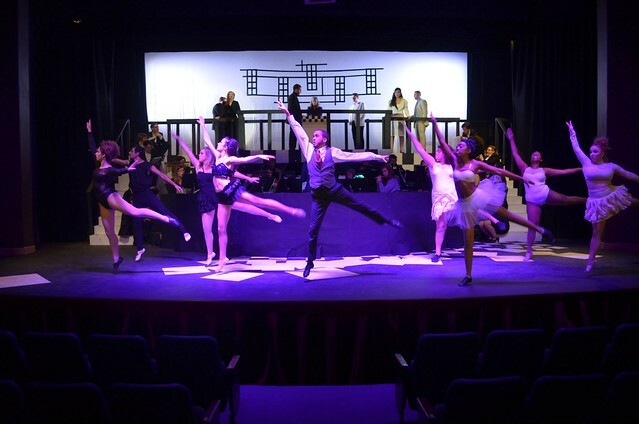 Creative aspects of this production have been inspired by the 1984 concept album and New York, Swedish, Australian, and 2008 concert productions, with special attention paid to the creator’s original concepts and ideas. We believe that we are telling you the most cohesive story, one that carefully examines the show’s roots while showing the way time (and revision) has made it a lasting and relevant story. Here’s what all the different scripts and productions of this story have in common, and something that we strive to convey to you in tonight’s performance: this is a story about passion. Passion for life, for art, for freedom, for occupation, for identity, and most of all, for each other. This is something that the cast, pit, and crew of tonight’s show has strongly identified with, as shown by their dedication to telling this story through dance, music, and the performing arts. Compiling elements of this show to tell this story has been a challenging and daunting task, and could not be possible without the help of everyone involved. I’d like to thank the cast, pit, technical crew, artistic team, production staff, and Dr. Pry for making this a truly memorable night in the theater. Enjoy the show, and thank you for supporting Wig and Buckle!